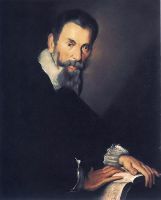 Claudio Giovanni Antonio Monteverdi (15 May 1567 (baptized) – 29 November 1643), was an Italian composer, gambist, and singer. Monteverdi's work, often regarded as revolutionary, marked the transition from the Renaissance style of music to that of the Baroque period. He developed two individual styles of composition: the new basso continuo technique of the Baroque and the heritage of Renaissance polyphony. Enjoying fame in his lifetime, he wrote one of the earliest operas, L'Orfeo, which is still regularly performed.